Scrapped 3 April 1933 at Genoa, Italy. Propulsion: One triple expansion steam engine, one shaft. 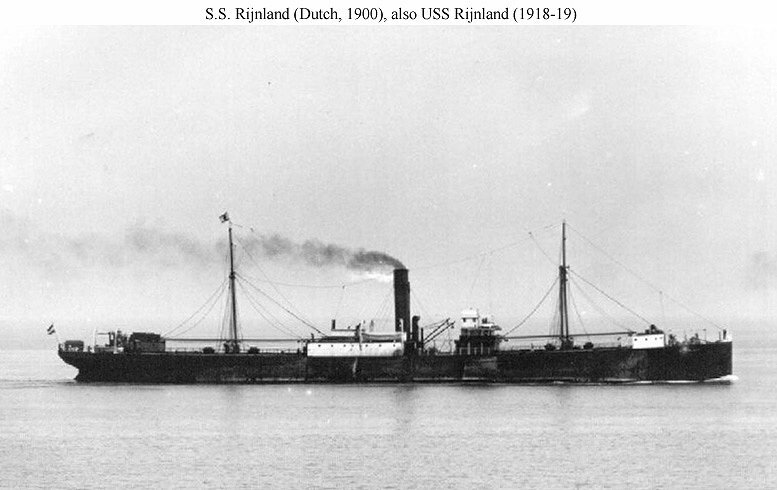 Dictionary of American Naval Fighting Ships: Rijnland, a single-screw steel cargo ship was launched during 1900 by Russell & Co. at Port Glasgow, Scotland, for the Koninklijke Hollandsche Lloyd Line of Amsterdam and interned during World War I at Newport News, Va. She was seized in March 1918 by Customs officials along with 88 other Dutch vessels, 31 of which entered U.S. Navy service. 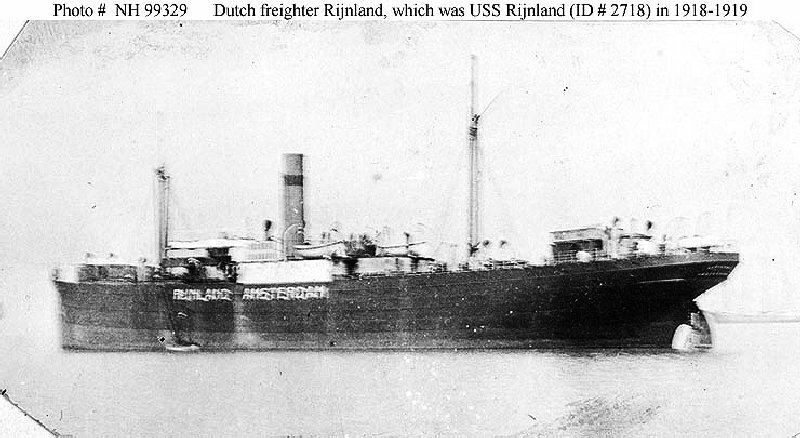 Rijnland was commissioned 29 March 1918 for service in the Naval Overseas Transportation Service, Lt. Comdr. Ottorino Bevilaqua, USNRF, in command. Rijnland made three voyages to French ports between 7 May 1918 and 14 December 1918. Loading at Jacksonville, Fla., Newport News, Va., and New York, she distributed Army supplies at St. Nazaire, Bordeaux, Brest, La Pallice, and Verdon, France. Returning to Newport News 14 December, Rijnland proceeded to New York where she loaded supplies for South American ports. Departing New York 14 February 1919, she called at Barbados before arriving at Rosario, Argentina, on 9 May. She returned to New York with a commercial cargo, then loaded Army coal at Philadelphia for St. Nazaire. Rijnland departed St. Nazaire 31 July 1919 for Amsterdam, was decommissioned there 6 August 1919, and was returned to her former owner the same day. Remaining in Koninklijke Hollandsche Lloyd service into the 1930's, Rijnland was broken up in Italy during 1933.